Only in the Northern Territory can you catch a fish with the chance of winning a Million Dollars! For its fourth season the Million Dollar Fish Competition has 5 chances at winning the Million Dollars. There are 5 Barramundi tagged with a Million Dollar prize. Once the first Million Dollar Barramundi is caught the remaining four become $10K prize Barramundi. If no Million Dollar Fish are caught during the competition period, the 5 tags will remain active until 30 September 2019. How Many have been caught? Three $10K tagged Barramundi have been caught and the fisho’s have received their prize money. The best chance of being in the draw to catch one of the tagged Barramundi is to get registered and get out on the water. If your a local experienced Barramundi Fisho you can extend your day trip to a few nights or even a week on the mothership charters. Bring your own boat and we’ll do the rest, providing comfortable air-conditioned accommodation and meals during your trip. Not a local and not experienced at Barramundi fishing? 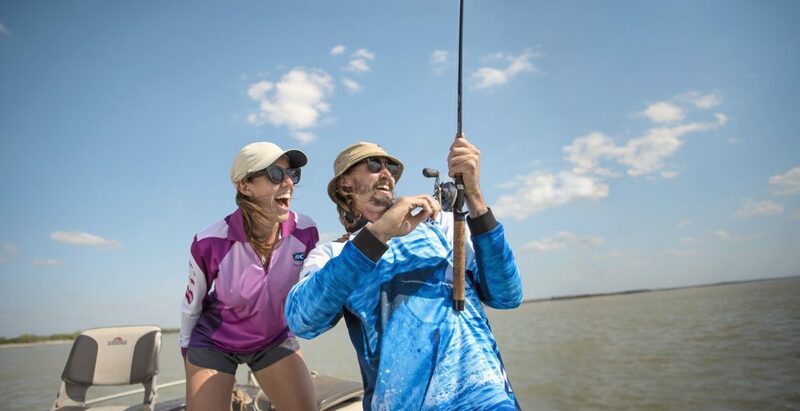 Jump on a guided fishing charter where the guides will put you onto the best spots and make sure you’ve got the right gear and the know how to hook the wild Barramundi.